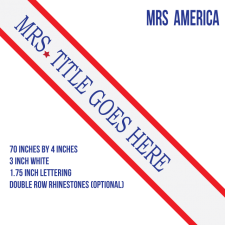 DISCOUNTED MRS / MISS OF AMERICA EMBROIDERED SASHES are only available to directors who order 10+ sashes per pageant season. Beautiful Miss for America Embroidered sash! Red, white and blue! Optional rhinestones will wow the crowd! Beautiful Mrs. America Embroidered sash! Red, white and blue with the immediately recognizable star! Optional rhinestones will wow the crowd!